Mechanisms of carcinogenicity are discussed for metals and their compounds, classified as carcinogenic to humans or considered to be carcinogenic to humans: arsenic, antimony, beryllium, cadmium, chromium, cobalt, lead, nickel and vanadium. Physicochemical properties govern uptake, intracellular distribution and binding of metal compounds. Interactions with proteins (e.g., with zinc finger structures) appear to be more relevant for metal carcinogenicity than binding to DNA. 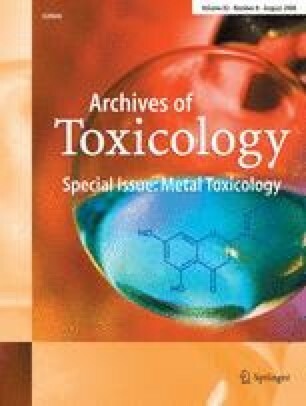 In general, metal genotoxicity is caused by indirect mechanisms. In spite of diverse physicochemical properties of metal compounds, three predominant mechanisms emerge: (1) interference with cellular redox regulation and induction of oxidative stress, which may cause oxidative DNA damage or trigger signaling cascades leading to stimulation of cell growth; (2) inhibition of major DNA repair systems resulting in genomic instability and accumulation of critical mutations; (3) deregulation of cell proliferation by induction of signaling pathways or inactivation of growth controls such as tumor suppressor genes. In addition, specific metal compounds exhibit unique mechanisms such as interruption of cell–cell adhesion by cadmium, direct DNA binding of trivalent chromium, and interaction of vanadate with phosphate binding sites of protein phosphatases.